A businessman and two "hitmen" he hired to launch a grenade attack on a Birmingham home have been jailed. Danyal Gurjee, 40, of Stockport, began a "campaign of intimidation" against a man he believed cost him £400,000 in a failed property venture, police said. Enforcers Stephen Cronin, 31, and Bradley Harrington, 30, from Liverpool, put an improvised grenade through a window at his Moseley home last May. At Birmingham Crown Court, all three received jail sentences. Gurjee was jailed for 16 years, Cronin for 21 years and eight months and Harrington for 25, at Friday's hearing. The property was damaged but no-one was hurt. The targeted businessman and Gurjee had both put money into a venture in the Democratic Republic of Congo, West Midlands Police said. When it collapsed in 2017, Gurjee sent him threatening text messages and made phone calls demanding his money back, according to the force, and paid Cronin and Harrington £8,000 to target him. 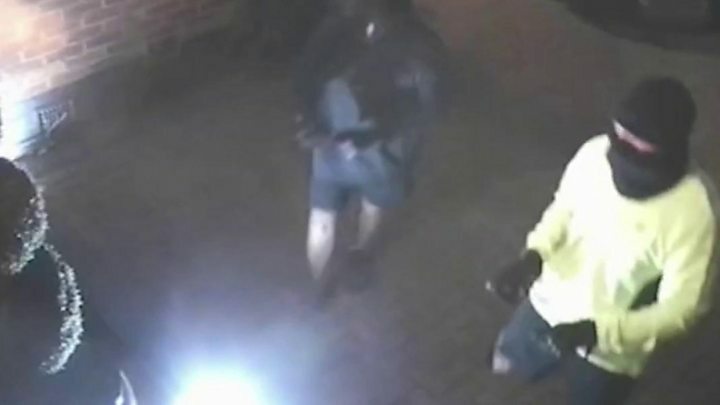 Police released a video showing Cronin and Harrington forcing open security gates, smashing a downstairs window and throwing in a grenade. "Seconds later it detonated causing damage running into tens of thousands of pounds, but thankfully the property was empty and no-one was injured," a force spokesman said. Gurjee, of Bramhall Lane, and Harrington both denied conspiracy to cause an explosion but were convicted, police said. Harrington, of Access Road, was also convicted of possessing grenades and a firearm. Cronin, from Pilch Bank Road, admitted the same charge as well as possession of two hand grenades and two guns. Det Insp Tom Hadley, of West Midlands Police, described Cronin and Harrington as "very dangerous hitmen". Gurjee was also found guilty of blackmail, along with his 36-year-old brother Abdul Gurjee, of Tabley Lane, Preston, who was jailed for eight years.